Newly crowned Ring Magazine World Lightweight Champion Juan Manuel Marquez (left) pressures former Ring Magazine World Lightweight Champion Joel Casamayor (right) during his 11th round TKO victory over former Ring Magazine World Lightweight Champion Joel Casamayor (right) on Saturday, September 13, 2008 at MGM Grand Garden Arena. 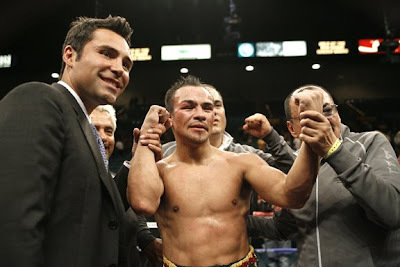 Newly crowned Ring Magazine World Lightweight Champion Juan Manuel Marquez(right) celebrates his 11th round TKO victory over former Ring Magazine World Lightweight Champion Joel Casamayor on Saturday, September 13, 2008 at MGM Grand Garden Arena. Newly crowned Ring Magazine World Lightweight Champion Juan Manuel Marquez (center) poses with Golden Boy Promotions President Oscar de la Hoya (left) and trainer Nacho Beristain (right) after his 11th round TKO victory over former Ring Magazine World Lightweight Champion Joel Casamayor on Saturday, September 13, 2008 at MGM Grand Garden Arena.